Ray & Pam have had the privilege of sharing their home with guests from all over the world. 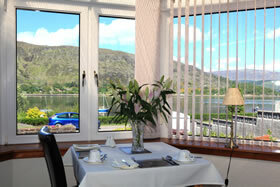 They are delighted to welcome new and returning guests to Ardlinnhe. They enjoy meeting and chatting with their guests, and are always on hand to advise and guide them on what to do and where to go, to help make their stay in Fort William a memorable one, Our guests can enjoy fabulous views of Loch Linnhe and the Ardgour Hills from our breakfast room, why not try a bowl of our traditionally made Scots porridge followed by a hearty cooked Scottish breakfast or if you prefer we have a selection of cereals , fresh fruit and yoghurts. We can also provide pack lunches, please let us know in advance if you require-a small charge applies. Fort William, the Outdoor Capital of The U.K is a superb base from which you can explore and capture the breath taking beauty of the west highlands, easy access to the major highland attractions, including the Isle of Skye, Loch Ness, Glencoe, Ullapool, as well as the famous castles, Eilean Donan, Urquhart, Dunvegan, Stalker, and Cawdor, made famous by Shakespeare’s “Macbeth”. Closer to Fort William, there is the Jacobite Steam Train, Nevis Range, Ben Nevis and Neptune’s Staircase to name but a few.